Carrying kayaks to and from the river or sea, loading and unloading kayaks from a car and retrieving a water laden kayak from the river or sea all involve lifting heavy objects and as such involve risk of injury. Take care that you do not cause yourself or anyone else an injury. Also take care not to damage other people's cars. Get assistance from others and learn the correct methods for emptying, carrying and retrieving kayaks. 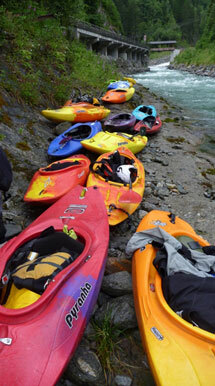 Most of our trips need cars with roofracks in order to carry kayaks to our paddling destination. Carrying heavy objects on your car roof on long distance journeys at high speeds on motorways, involves additional risks for a car driver. Roofrack failure due to overloading or excessive speed or high winds on a motorway could cause havoc. Also damage can occur to your car, (e.g. if a kayak falls from your roofrack onto your wing mirrors whilst loading). It is therefore necessary for car drivers who are unused to fitting roofracks, securing kayaks onto a roofrack or driving with heavy loads to ensure that they do so in a safe manner. This printable document gives advice to car owners on how to do so, as well as advice on where to buy a suitable roofrack. If you are unsure on how to load kayaks onto your roofrack or how to secure them, then get advice from a more experienced member. As a car driver it is your responsibility to ensure that your car and load is safe. Always check that your load is secure yourself before setting off!